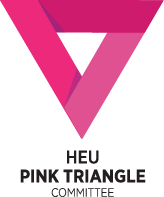 The Lesbian and Gay Standing Committee became the Pink Triangle Standing Committee at the union’s 2008 convention. The committee works to improve and enhance awareness of lesbian, gay, bisexual, transgender, two-spirited, intersex, queer and questioning members of our union. It provides a networking support system to guarantee HEU members have a safe and harassment-free workplace. In 1992, HEU sponsored participants to attend OUTRights, a conference on gays and lesbians and the law. This marked the beginning of gay and lesbian visibility within HEU. The following year, the union’s Provincial Executive funded a Lesbian and Gay Focus Group at the HEU Summer School in an effort to eliminate homophobia and address oppression. Delegates from the Pink Triangle Standing Committee also attend national conventions and sit on other trade union committees, representing the interests of HEU’s *LGBTQ+ members, including the Canadian Union of Public Employees’ National Pink Triangle Committee and the Canadian Labour Congress’ Solidarity and Pride Working Group. The committee also has a Facebook page to share information and resources. *LGBTQ+ is recognized as short-form for those who self-identify as lesbian, gay, bisexual, transgender, two-spirited, intersex, queer or questioning.